Critics have greatly exaggerated the military’s role in Egypt’s economy, President Abdul Fatah Sisi said on Oct. 25, one day after Prime Minister Sherif Ismail said the military’s involvement in the economy would be reduced in the next two to three years. The military’s economic activities are equivalent to 1 to 1.5 percent of GDP and not more than 20 percent as some have claimed, Sisi said in a televised speech. 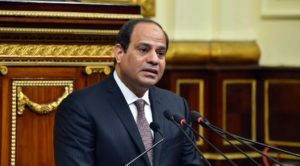 Sisi, who was elected in 2014, has vowed to revive the nation’s struggling economy, which saw a large portion of its main sources of foreign currency, investors and tourists, scared away by the 2011 uprising and the ongoing battle with terrorists in the Sinai Peninsula. Egypt’s army has assisted in major infrastructure projects and with the distribution of subsidized commodities to keep a lid on rising prices amid a shortage of dollars that has increased the cost of goods. “In case you’re wondering how large the economy of the armed forces is in terms of GDP, I’m going tell you so it’s clear: 1 to 1.5 percent,” Sisi said at a national youth conference held in Sharm el-Sheikh. Along with infrastructure projects, the military in the past has produced everything from bottled water to baby formula. Sisi said the military is not entering the economy to profit or compete with the private sector, and that its projects are subject to taxes and regulatory oversight. He added that the military would deliver 1,350 projects by 2018 but did not specify their exact nature. Egypt signed a preliminary agreement with the IMF in August and is looking to use the incoming funds to support its reform program that aims to reduce the nation’s large budget deficit.